This sterling 1955 session for Atlantic paired the two leading lights of the Tristano school to produce a programme of cool bop to satisfy most modernists of the day. 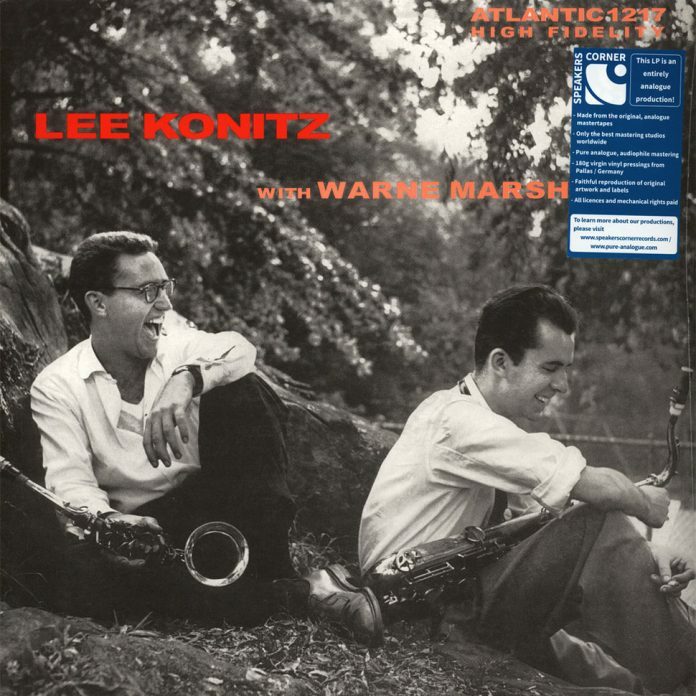 Konitz was at his considerable best at this time and Marsh wasn’t far behind. They had a top-notch rhythm section in Mosca, Pettiford and Clarke with that fine guitarist Bauer adding ballast to the section as he did not get a lot of solo space here. The two front-line horn players were highly compatible and with the Konitz cool alto and Marsh playing soft focus tenor in the high register, it is often difficult to tell them apart. No matter, the music swings along in low key with Pettiford adding to the solo strength with his strong, warm bass sound. The programme begins with the old Basie favourite “Topsy”, both horn men keeping a continuous melodic line moving. They do the same on all these selections. The sextet take “Donna Lee” at a fast clip, similar to Parker’s tempo although the cool sounds are distinctive in Tristano mode. “Don’t Squawk” is the longest track, a slow blues by Pettiford which he introduces and sets up. Although an original bopper he fits into this music like the master he was. His powerful bass line and solos provide an extra dimension in tandem with Clarke who is also first class throughout. “Ronnie’s Line” and “Background Music” are the best tracks to hear the continuous melodic lines that Konitz and Marsh fashion here. The two standards also give a fresh aspect to their usual performances and still sound distinctive today more than 60 years later. This is timeless music of high quality and very well mastered by Speakers Corner in exact duplicates of the original issues in 180-gram vinyl. Konitz (as); Marsh (ts); Sal Mosca or Ronnie Ball (p); Billy Bauer (elg); Oscar Pettiford (b); Kenny Clarke (d). NYC, June 1955. "...timeless music of high quality and very well mastered..."